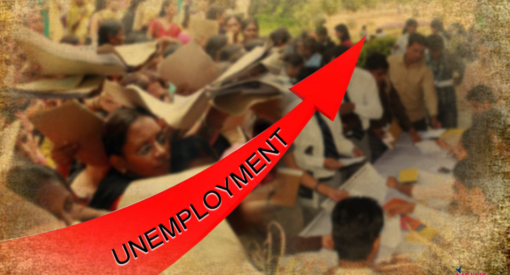 With unemployment in India reaching a 45-year high, it is not surprising that a new voter survey by the Association for Democratic Reforms (ADR) has found employment as the overwhelming priority for Indian voters. The Modi government has also failed to provide basic amenities for living such as healthcare and drinking water and even accessible public transport to the vast majority of the population, indicates the survey. Released on March 25, 2019 — as the Lok Sabha elections loom large — the ADR survey covered 534 Lok Sabha constituencies and 2,73,487 voters spread among various demographics. It was conducted between October 2018 and December 2018. Nearly half of the surveyed voters — 46.80% — rated ‘Better Employment Opportunities’ as their top concern. The ADR survey comes after the Narendra Modi government has already stopped the release of at least three recent government reports with data on the jobs created in the country before the 2019 Lok Sabha elections. In January, the Modi government had withheld the release of the National Sample Survey Office Periodic Labour Force Survey that pegged joblessness at a 45-year high of 6.1% during 2017-2018. In March, it was reported that a survey by the Labour Bureau on the number of jobs created under the Micro Units Development & Refinance Agency (MUDRA) would not be made public for another two months, until after the elections. The Modi government had earlier also withheld the 6th annual employment-unemployment survey by the Labour Bureau, which showed India’s unemployment rate in 2016-17 was the highest in four years at 3.9%. The ADR survey found that in seven out of the eight most socio-economically backward states — known as Empowered Action Group (EAG) states — jobs were obviously the foremost voters’ priority. These states are Bihar, Chhattisgarh, Jharkhand, Madhya Pradesh, Rajasthan, Uttarakhand and Uttar Pradesh. Better hospitals/primary healthcare centres were the next biggest concern with 34.60% of the surveyed voters highlighting that as their top priority and drinking water being flagged after that with 30.50% — more than a third of the total surveyed voters. These issues were trailed by better roads (28.34%) and better public transport (27.35%). The All India Survey On Governance Issues and Voting Behaviour 2018 casts a light on the voters’ priorities from among 31 listed issues including drinking water, food, electricity, roads, education, healthcare, agricultural loan availability, public transport, law and order and even terrorism, among other things. According to ADR, this is “perhaps the largest ever Voter Survey in any country.” Voters were asked to list out their top five priorities, as well as to rate the government in terms of its performance on these issues in their respective regions. The performance of the government was gauged — “in terms of its capacity, governance and specific role in improving their living conditions” — on a scale of 1 to 5. A three-level scale for classification was used, with good at the weightage level of 5, average as 3 and bad being 1. In terms of performance, the Modi government fared the worst — even worse than on the jobs front — when it came to issues relating to agriculture in the country, which also sheds light on the agrarian crisis in the country. Voters rated the government performance on agricultural subsidy for seeds/fertilisers ( a priority for 25.06% of surveyed voters) as 2.06 out of 5. Access to agricultural loan was flagged as the main priority by 25.62%, and the performance was rated as 2.15 out of 5. This dismal performance by the government was only matched by its performance on the jobs front — also rated as 2.15 out of 5. Availability of water for agriculture (a concern for 26.4% of the voters) was hardly better at a score of 2.18 out of 5. High price realization for farm products was top priority for 25.41%, but the government again did not do much about it, with performance being 2.23 out of 5. It is clear that the BJP-led NDA has failed to provide basic public amenities and infrastructure, as the performance regarding healthcare, drinking water, roads, public transport, and law and order were all rated ‘below average’ — less than 3 out of 5. The survey had three stated objectives — identifying voters’ priorities on specific governance issues; voters’ ratings of the government's performance on those issues; and factors affecting voting behaviour. As ADR says, these basic public services are “key to developing human capabilities” — and are indispensable for “inclusive and equitable development”. The ADR did a comparative analysis of this 2018 voters’ survey and the earlier All India Mid-Term Survey 2017. The top two priorities — better employment opportunities and better hospitals/primary healthcare centres — have remained at the top. However, the significance of better employment as a priority has increased by 56.67% — from 30% in 2017 to 47% in 2018. But the performance of the government on jobs declined from 3.17 to 2.15 on a scale of 5. Similarly, the importance of better healthcare as a concern has aggravated by 40% — from 25% in 2017 to 35% in 2018 — even as government performance fell from 3.36 to 2.35. The priority of drinking water among voters seems to have increased the most, by 150% — from 12% in 2017 to 30% in 2018. The performance worsened from 2.79 to 2.52. The significance of better roads as voters’ priority increased by 100% from 14% in 2017 to 28% in 2018 — while performance declined from 3.1 to 2.41. Also, among the 32 states and Union Territories surveyed, voters in 29 of them gave below-average ratings to the government performance on their top three voters’ priorities at the state level. The only exceptions were three UTs — Dadra and Nagar Haveli, Daman and Diu, and Puducherry. When it comes to analysis of voting behaviour, the All India Survey 2018 found that for 75.11% of the voters surveyed, the Chief Minister candidate was the most important factor behind voting for a particular candidate — followed by the candidate’s party (71.32%) and the candidate (68.03%) himself/herself. The survey also found that “distribution of cash, liquor, gifts etc. was an important factor behind voting a particular candidate in an election,” for 41.34% of the voters. As regards voting for candidates with criminal records, most voters (36.67%) said that people voted for such candidates because they were unaware of his/her criminal records. But 35.89% said they would vote for a candidate with criminal records if the candidate has done good work in the past. Most worryingly, while 97.86% voters “felt that candidates with criminal backgrounds should not be in Parliament or State Assembly, only 35.20% voters knew that they could get information on criminal records of the candidates” — indicating the inability of Indian voters to make informed decisions due to information asymmetry.